Art and technology company VSCO has recently moved into a new office space located in Oakland, California which were designed by DeBartolo Architects. 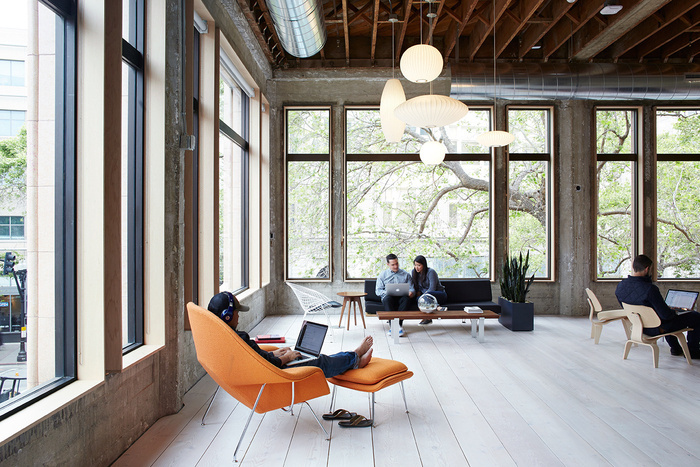 Office Snapshots: How was Oakland selected as the location for VSCO’s offices as opposed to other popular Bay Area communities? Joel Flory: Oakland is my hometown. It embodies how we see ourselves as a company scrappy and hard working with a diverse and international community. Practically, it’s central for Bay Area. We could have chosen anywhere but Oakland was our ideal location for the office and feel of how we see ourselves. Everything about the build out and the space is an outward extension of who we are, personally and as a company. OS: What were some goals which helped define what the new VSCO office should be like? JF: Do less. Then put time, effort, & money into those few things. It’s very simple, but feels amazing to be in. We used a lot of natural materials and the existing surrounding materials to create something modern and clean, but comfortable and warm. The ceiling is douglas fir, as well as the floor­ both are 75 years old and from the same area outside of Portland. Concrete walls shape the space. Instead of covering them up, we let them be. We wanted as little drywall as possible. The main materials are concrete, glass, wood, and steel. All electrical conduit is done and doesn’t cross over itself, very clean and architectural. It’s meant to feel extremely open but connected. There are two large work spaces off to the side with the center being communal seating, conference room, more seating, more conference rooms. Even the conference rooms needed to have a connection with the surrounding areas. Our second floor is a little more enclosed for quiet and privacy. OS: How was the clean and minimal aesthetic chosen? JF: Prior to moving in the space had been abandoned for some time. The majority of the space was stripped down with walls partially demolished and lights hanging. With regards to the aesthetic it was derived from our brand as well as heavily directed by our architect. OS: Has VSCO found the office to be a helpful tool in terms of employee productivity? JF: The space feels more like a creative haven than an office and I think our employees appreciate that. The open layout allows for easy collaboration which helps employee productivity across teams.